Aladdin is a fictional character and the titular protagonist of Walt Disney Pictures' 31st animated feature film Aladdin (1992) based on Aladdin, a folk tale of Middle Eastern origin. He is voiced by American actor Scott Weinger, while his singing voice is provided by Brad Kane. He also stars in the two direct-to-video sequels The Return of Jafar (1994) and Aladdin and the King of Thieves (1996), as well as the animated television series based on the film. Mena Massoud is set to play a live-action version of the character in a live action adaptation of the 1992 film. When Aladdin is initially introduced, he is eighteen years old. He never received a formal education, and has only learned by living on the streets of Agrabah. He has to steal food in the local market in order to survive. He was born to Cassim and his wife. When Aladdin was only an infant, his father left him and his mother in order to find a better life for his family. When Aladdin was two, his mother was captured by bandits and was presumed dead. Aladdin's parents were too poor to provide clothing for their son. When Aladdin was seven, he had his first encounter with Razoul, the new captain of the Sultan's guard. Aladdin had stolen an apple from a fruit stand. Initially, the boy managed to outmaneuver the guards. Eventually, he was apprehended and sentenced to detention within the palace dungeon. However, he managed to escape by picking the locks to his chains. When he was twelve, he stole a vest, a pair of pants, and a fez from a clothes line. When he was sixteen he fell in with a group of circus performers, one of whom was the monkey Abu. One of the first issues that the animators faced during the production of Aladdin was the depiction of Aladdin himself. Director and producer John Musker explains: "In early screenings, we played with him being a little bit younger, and he had a mother in the story. [...] In design he became more athletic-looking, more filled out, more of a young leading man, more of a teen-hunk version than before." He was initially going to be as young as 13, but that eventually changed to 18. Supervising Animator Glen Keane used parts of teen idols and movie actors to build Aladdin's physique. The main inspiration for his appearance was originally Michael J. Fox in Back to the Future, but later changed to Tom Cruise. 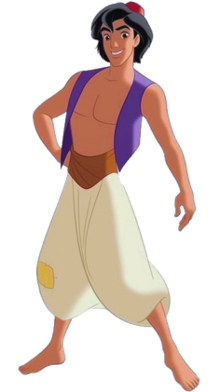 Keane based the movement of Aladdin's loose pants on rapper MC Hammer. Some have said this conception of the character makes him almost too contemporary for the setting of the film. Aladdin was drawn with large eyes, like those of other Disney heroes, to indicate innocence. The lineaments of his body are more free-flowing and more rounded than is usual for Disney heroes. He looks like a modern 18-year-old, except for his wardrobe. In the movie, they often describe him as a street rat. Aladdin is portrayed as quick-witted, and ultimately a caring person. Like most Disney male protagonists, he is a heroic young man who seeks to win the affection of many other characters, which demonstrates his insecurity. He is not above lying and stealing, though never with malicious intentions, but in order to survive. The biggest difference from the norm is that, unlike most youthful Disney heroes, he is a doer rather than a passive character. In the first film, street rat Aladdin meets a girl in the marketplace. He falls deeply in love with her at first sight, but he gets into trouble when their meeting is interrupted by guards who arrest him. She reveals that she is actually Princess Jasmine. Despite Jasmine's efforts to demand the guards to release Aladdin immediately, they tell her that she must first deal with Jafar in order to free him. In prison, Aladdin meets an old man (who is actually Jafar in disguise) who mentions a cave filled with treasure and that he needs Aladdin to enter it. The old man reveals a secret exit, and Aladdin escapes with him and follows him into the desert. He enters the Cave of Wonders, where he meets a sentient magic carpet and is commanded to only get a magic lamp. He gets it, but Abu's grabbing of a giant gem causes the cave to collapse. Aladdin, Abu, and the carpet are left in the cave. Abu delivers the lamp to Aladdin, and when he rubs it, a giant blue Genie appears, telling Aladdin he will fulfill three wishes. After leaving the collapsed cave with the Genie's help, he decides to become a prince in order to win Jasmine's heart. In the first direct-to-video sequel, The Return of Jafar (1994), Jasmine begins to question her love for Aladdin, wondering if he is a duplicitous liar after he saves Iago, Jafar's former pet parrot who had tortured her father. Meanwhile, Jafar is freed from his lamp by a socially awkward bandit named Abis Mal, and immediately plots his retribution against Aladdin. An animated series was created for Disney Channel and Toon Disney which aired from 1994 to 1996, based on the original 1992 feature. The series picked up where The Return of Jafar left off, with Aladdin still living on the streets of Agrabah, engaged to Jasmine. In the Aladdin television episode The Lost Ones it is shown that he had a childhood friend named Amal. The episode Seems Like Old Crimes shows that when Aladdin was sixteen, he fell in with a group of circus performers where he met his pet monkey Abu. Finally, in the second direct-to-video/DVD movie and third film in the series, Aladdin and the King of Thieves, Aladdin discovers that his long-lost father, Cassim, is still alive, and sets out to find him. Cassim had left the family shortly after his son's birth. Aladdin's mother died when he was just a child. At the climax of the film, Jasmine and Aladdin are finally wed, and Aladdin reconciles with his father. The Return of Jafar and Aladdin and the King of Thieves together serve as bookends to the Aladdin (TV series) as its prologue and epilogue, respectively. Aladdin was formerly a member of the Disney Adventurers franchise targeted at young boys sold by the Disney Store from 1999-2004, which sold various merchandise, mostly including toys. Hercules and the Arabian Night is set after the end of King of Thieves as Jasmine refers to herself as married. He is featured as a guest in Disney's House of Mouse, Mickey's Magical Christmas: Snowed in at the House of Mouse and Mickey's House of Villains. Aladdin appears in various video games, including the game versions of the film. Aladdin has also appeared in the acclaimed Kingdom Hearts series of games. In all his appearances in the series, he is a playable character or can be added to player's party. He wields a scimitar as his primary weapon and can utilize Abu to solve puzzles when he is an active party member. In the first game, Princess Jasmine is kidnapped by Jafar and Maleficent. Aladdin teams up with Sora to save her. In Kingdom Hearts II, Aladdin is found experiencing deep depression due to his loneliness after Genie went to see the other worlds. When Genie comes back all is well again. Aladdin appears in the Nintendo 3DS game "Disney Magical World." Agrabah is one of the four movie worlds accessible to the player, and several characters from the movie appear in the game. The player may also collect a number of Aladdin-themed items and clothing pieces. Aladdin also appears at the Walt Disney Parks and Resorts as a meetable character. He is a frequently-seen character, and often accompanied by Jasmine, and occasionally Genie. Though he goes barefoot in the film, he wears moccasins in his street rat clothes. Aladdin, Jasmine, Carpet, Abu and Genie make cameo appearances in the Hong Kong Disneyland version of It's a Small World. In the Broadway musical adaptation, Aladdin is played by actor Adam Jacobs. ^ Diamond in the Rough: The Making of Aladdin (Documentary). Aladdin Platinum Edition (Disc 2): Buena Vista Home Video. 2004. ^ a b "Aladdin Character History". Disney Archives. ^ "Adam Jacobs and Courtney Reed Will Co-Star in Disney's Aladdin; Complete Cast Announced". playbill.com. Playbill. 16 September 2013. Archived from the original on 13 December 2013. Retrieved 11 March 2014.